MetroDecor 6684MDK - Each organizer comes with hardware to mount on a wall or cabinet door for easy storage. Transform your under-sink and kitchen cabinets from cluttered and crowded to streamlined and organized with the Kitchen Cabinet Storage Organizer from mDesign. Mdesign - more calm, offices, on walls in kitchen, pantry, entryways, less clutter Maximize storage space: this mounted organizer basket is the perfect way to store cleaning supplies in one convenient place without sacrificing your storage space; Save valuable storage space in your cabinets and pantry with this handy organizer; Works inside or outside of cabinet and pantry doors, craft rooms, mudrooms, and garages. 2 level storage: this generously sized organizer features a large bottom basket that provides plenty of room to store taller bottles; The top shelf is great for keeping smaller items handy; Keep all of your cleaning supplies contained and your cabinets clutter free; Also use in laundry rooms, garages, utility rooms and more. Easy installation: free up space in crowded kitchen cabinets and pantries by mounting on cabinet doors for instant storage; Hardware included; Versatile and easy to use, condos, campers, the organizer is perfect for adding storage to small spaces - use in homes, apartments, dorm rooms, and RVs to maximize storage space. 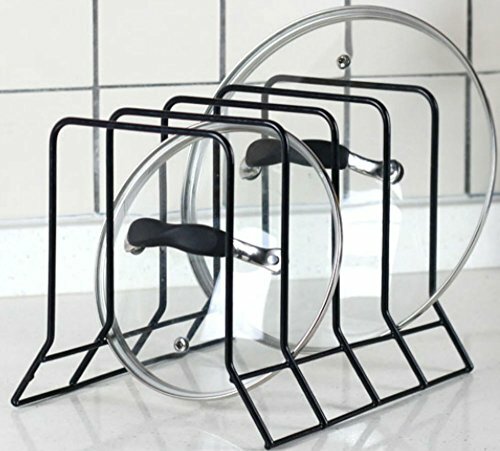 Hang Over Cabinet Doors in Kitchen/Pantry - mDesign Over Cabinet Kitchen Storage Organizer Holder or Basket - Holds Dish Soap, Window Cleaner, Sponges - Steel Wire in Bronze Finish - Durable construction: Made of strong, sturdy steel wire with a durable rust-resistant finish. A shallow top basket holds sponges, dishcloths, scouring pads, and more. The large bottom basket provides plenty of room to store window cleaner, dish soap, furniture polish, and more in one convenient place. Hang inside cabinets for discreet storage, or on kitchen walls to utilize unused vertical space and make grabbing what you need quick and easy. Neat-O KC-KR-001 - Color match any kitchen. Organize and store lids, placemats, serving trays, bakeware, etc. Color match any kitchen. Use in kitchen cabinets, pantry, or on kitchen counter. Stores pod lids, serving trays, placemats, bakeware, etc. Measures 10-1/8 by 7-5/8 by 7-1/2 inches approximately. No more lost lids tangled among stacked pots and pans. This pod lid holder incorporates "Simple is Best" concept into functional stylish design. Incorporating "Simple is Best" concept into functional stylish design. Non scratch coating protects stored pot lids from being damaged. With this useful addition to your kitchen counter, pantry and cabinets. Constructed from durable steel.